This year’s project, The Way Up, finished off with what may be the mother of all Way Ups! The Eiger, from Grindelwald, with Ueli Steck. Ueli is a close friend and someone I have shared a lot of days in the mountains with, including three Himalayan expeditions. In fact, it was probably Ueli that inspired me to do this project of seeking out the biggest valley to peak days. In 2015, Janine and I were with Ueli in Nepal’s Khumbu Valley during his acclimatization period for Nuptse. 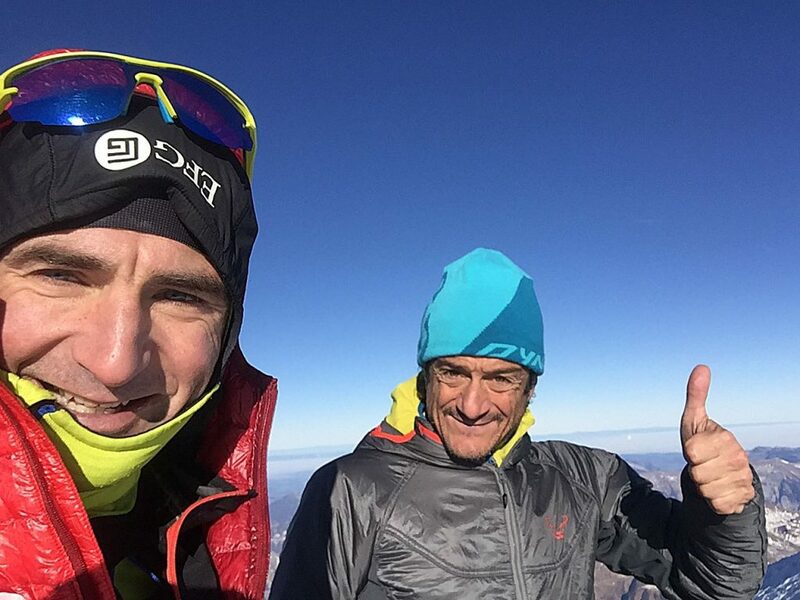 With his partner sick, Ueli was putting his fitness to the test with mountain runs. The obvious choice for training, and speed efforts, was the classic trekking peak Lobuche (6100 meters) above our guesthouse basecamp in Dzonghla. 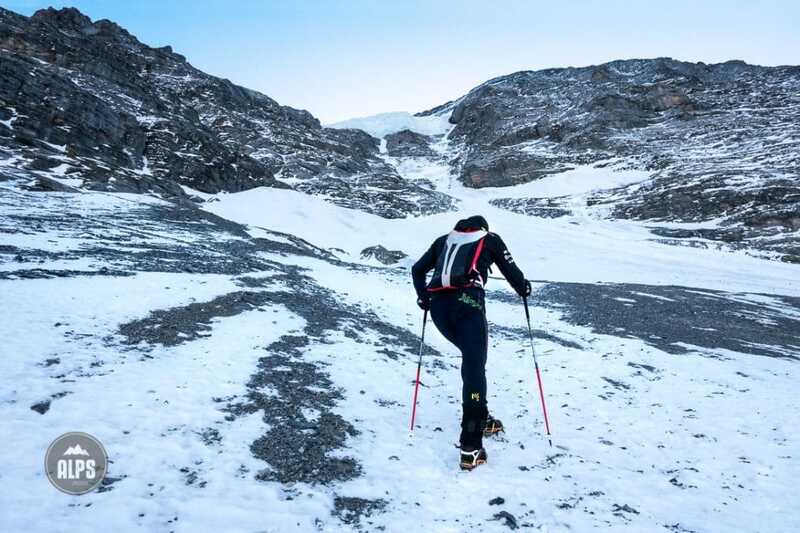 Typically done in two or three days with a high camp, Ueli had discovered it to be an ideal “run” from even much lower in Dzonghla. His best time to the summit… 1:49. I realized if Ueli is doing this thing in running shoes, with only trekking poles, I’d like to have a go as well. I set out from Dzonghla in my light alpine boots and one ice tool. Five hours later, after being all alone on the mountain and summit, I was down – and my mind was opened to all new ideas. Ueli and I, and many others, have been doing our own versions of this style for a long time. But this year I named it The Way Up so I could share the routes by category. For this style of running, the Alps are the ideal playground. For 2016, we created a big list of peaks to run. These peaks that are typically done in two days we were running in a day, from deep valleys to alpine summits. I certainly don’t have the alpine skills of Ueli Steck, but I have my own skill set that I can apply to my own set of objectives. We all can. This style of trail running, applied to the high mountains, is a natural progression of what we want to do with our fitness, where it can take us, and the way for a sport to evolve. This way of thinking is what is moving alpinism forward as well with huge Himalayan peaks being done as “mountain runs”. Of course it’s all relative to who is doing the “run”. And who’s leading this way of thinking? 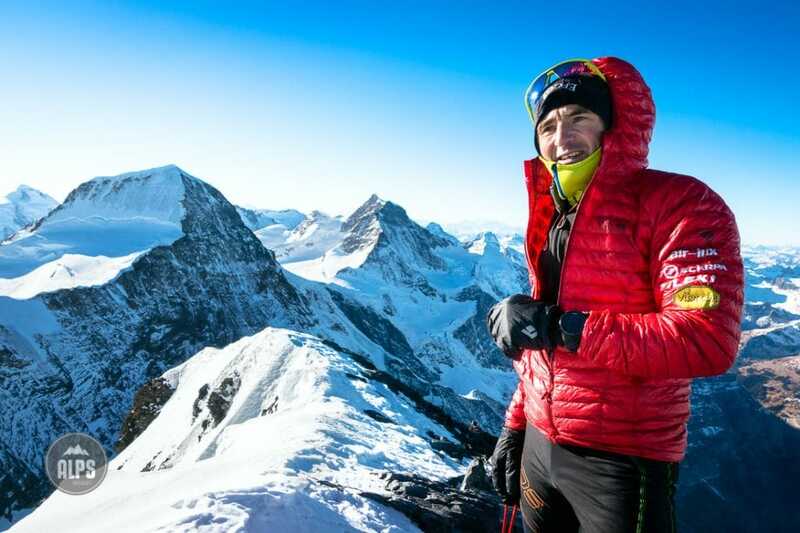 Ueli Steck. On December 30 in the frozen darkness of Grund, just below Grindelwld, Ueli and I set out with light alpine boots and small running packs. We had steel crampons and an ice tool each. Our goal was to power hike to the Eigergletscher Station, then start climbing the frozen West Flank of the Eiger. Ueli has been on this very route numerous times in the last weeks as baseline training. Conditions he said, were icy, but perfect. The zero snow year we’re having has some advantages. We weren’t the only ones out, in fact the Eiger Nordwand was a line of headlamps from bottom to top. But for us, our line of ascent is the classic line of descent. Why? Training… it’s one enormous nonstop “run”. How many other peaks offer 3100 meters of elevation gain from town on relatively easy technical ground without glaciers? To a classic alpine summit! The West Flank is certainly not an Alps classic. Rather, it is a long, snow covered frozen slab covered in loose rock. The “frozen” part is what makes it desirable at the moment. What makes it interesting is that it is a lot of walking up steep snow and ice, with huge exposure and stunning views. There are a few steep icy steps that provided me with some excitement on the descent. While it isn’t a great route, it was great for what we wanted – a huge day. From Grindelwald, it was five hours to the summit at what was a steady moderate pace. Five hours of moving upward in the mountains, from a famous town to one of the Alps most famous peaks. In between the bottom and the top was a whole lot of what we love. Movement. I have been hugely inspired by what guys like Ueli, Killian Jornet and David Göttler are doing. I’ve taken that inspiration and applied it to my own skill and fitness level to come up with what is possible for me. I hope I can pass this same inspiration along and you’ll have your own ideas to experience some of this. To see the line, and route, visit my Suunto Movescount. If you would like to see more from this project, visit The Way Up, or on Instagram at #thewayupALPS. Also, if you have some favorite peaks that could be a part of this, please share in the Comments section. For this day, I wanted to shoot real photos of what I saw. I carried a Sony RX100 Mark IV and shot on the fly, or asking Ueli for a quick pause so I could prepare the camera. Here, Ueli’s at the very bottom of the West Flank of the Eiger. Directly above him is a serac that must be traversed beneath to the left side, the same that unloaded a massive piece of glacial ice this year. 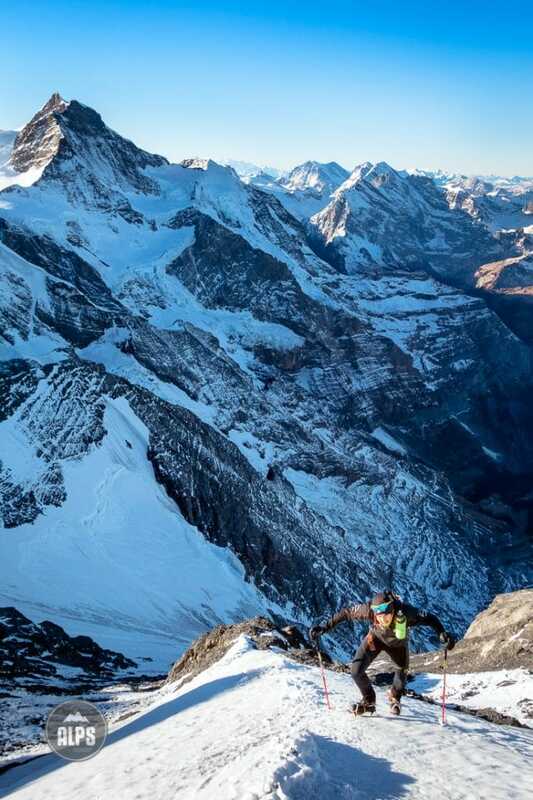 Ueli Steck on the West Flank of the Eiger. Just how little snow is on the ski pistes is evident below. 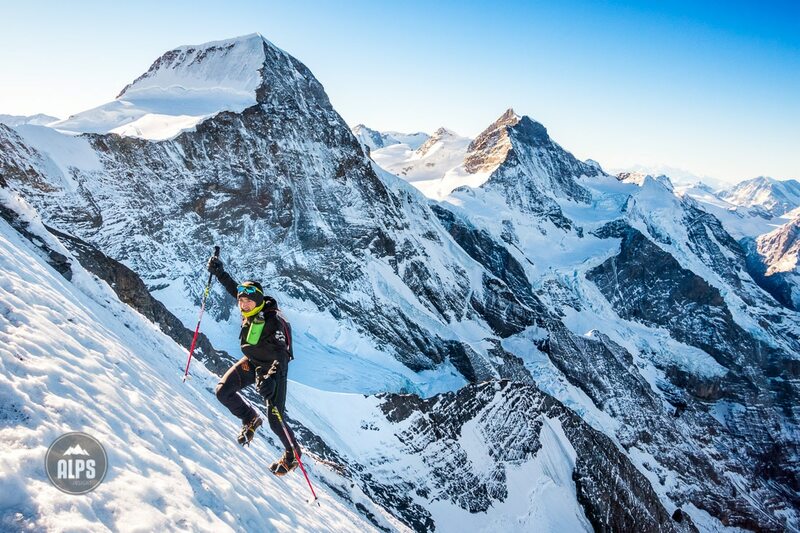 Ueli Steck on the summit of the Eiger after climbing the West Flank route for training. Happy New Year! I hope you get some of your own Way Up days in 2017. Best to consult a climbing guide book!